Hello. 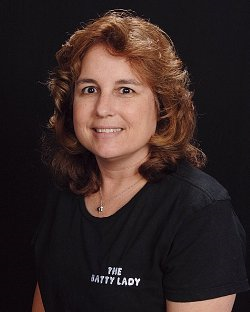 My name is Alicia Campbell and I am “The Batty Lady.” I belong to the Inland Empire Quilt Guild and live in Orange, CA. I have three adult children. I learned to hand quilt from my grandmother when I was in elementary school. She was “old school” which meant that if the stitches were too big or not uniform, you got to rip out the stitches. I quilted until my second son was born and then I took a hiatus while my three children were small. During that time the quilting industry evolved with machine quilting, rotary cutters and major improvements in quilt batting. I have always been fascinated with what goes inside a quilt sandwich, so when I resumed quilting I began to look at what currently was being used and all the changes that had been made. I started studying the different choices of batting and what gave quilts their different looks. I also discovered that it was almost impossible to find those choices in one place. Local quilts stores sometimes have batting; most do not. Major stores have some choices but they don’t always have samples. Most quilters are tactile, so online stores might have more choices but you’re not able to touch and feel the differences and quilt shows rarely had a booth with batting. So “The Batty Lady” came to be. I do hours of research about the current products and trends in batting, I talk to the manufacturers, I do test samples of the battings, and I make quilts using both hand and machine methods. I bring numerous types of batting to shows and quilt guilds in the California, Arizona and Nevada so that those in attendance can touch and feel the products. After listening to my “batting informational” quilters can make an educated choice for the quilt batting they need. Because quilt batting is a preference based on what type of quilting you plan to do and what your desired look is for the finished product. I answer questions via the phone, internet or at shows. Got a batting or quilting question, just ask! And Now I have joined with Wonderfil Speciality Threads and we have created the US Warehouse for Wonderfil and A Threadeducation Center for you to ask questions about thread, batting and quilting. Here you can test out threads, take classes or purchase thread, batting and some notions so that you can Finish That Quilt.